Are our ‘digital brains’ losing the ability to handle ‘deep reading? Are we “developing digital brains” that are suitable “for skimming through the torrent of information online” but unable to handle “traditional deep reading”? The consequences may include a dwindling proficiency in “reading long sentences with multiple, winding clauses”. Wolf hears from college professors about this problem. Convoluted prose is not limited to fiction, but also exists in history and science texts. I am currently reading a text dealing with the tax benefits of college savings options, and it’s replete with convoluted syntax. … Because of their easy navigability, paper books and documents may be better suited to absorption in a text…. Compared to print, online content lends itself to nonlinear reading. Sentences tend to be shorter and syntax is simpler. Links encourage interruptions. Sometimes we are biased in thinking screen reading offers superior comprehension. This might be especially true for younger readers. …A 2012 Israeli study of engineering students — who grew up in the world of screens — looked at their comprehension while reading the same text on screen and in print when under time pressure to complete the task. Using the Internet is ‘supereasy’, but ‘deep reading, advanced math, scientific reasoning’ is hard. Posted in learning | Comments Off on Are our ‘digital brains’ losing the ability to handle ‘deep reading? Paige Jaeger, Coordinator of School Library Services for WSWHE BOCEs in New York, offers the basics of Lexiles 101, including how they fit into Common Core Standards. The Common Core has defined where “college and career ready” (CCR) students should be reading and it’s a 1450 Lexile. Therefore, they scaffolded in reverse levels to graduate students at the appropriate level. These Lexile levels are more difficult than where typical students are reading. Lexile is an algorithm. It is a mathematical assessment of a linguistic product. The parent organization to the CCSS, (CCSSO formally called the Governor’s convention) recently released a white paper verifying the validity of text complexity. Therefore, we have to pay attention to this essential shift to embrace “rigor” in reading. To read the recent white paper from the Council of Chief State School Officers click here. This article compares a number of algorithms and the summarizes text complexity for the CCSS. Text complexity formulas were meant for instructional purposes. CCS does not require teachers to select texts based only on complexity. Reader and the task -is there enough in the text to foster good discussion, value -added assignments, and begin a knowledge exploration. How can I use this novel or passage to foster critical thinking skills? Jaeger writes that “Microsoft Word’s Flesch-Kincaid measure has also been proven valid”. That’s good to know since I find it is a handy tool to use in assessing writing. Many of us assume that Americans spend more time watching TV than reading, and here are some graphics that show the numbers within various age groups. 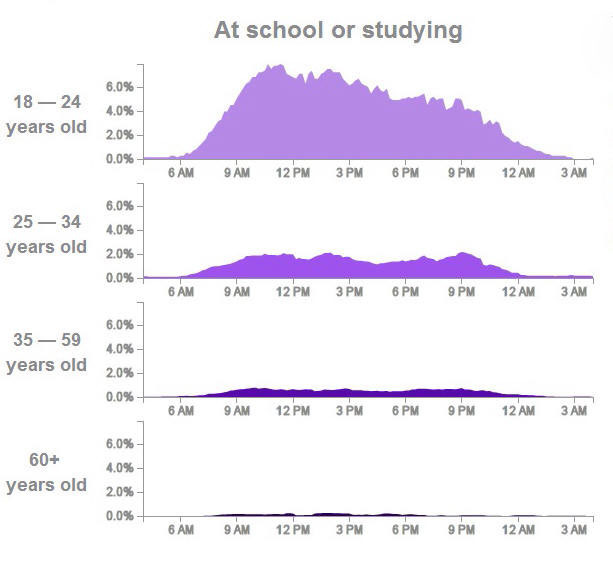 These charts show what percent of the population is engaged in the stated activity at that particular time. Older people read more. Fewer than 2% of 18-24 year-olds are reading for pleasure at any hour of the day. However, young people are presumably doing more school-related reading. 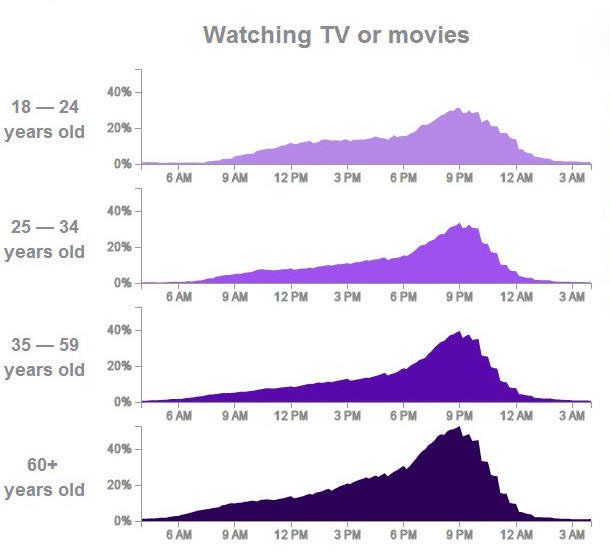 Americans of all ages watch a lot of TV. The source is the U.S. Bureau of Labor Statistics American Time Use Survey (2012). More charts on other activities can be seen at Chris Walker’s website. The lazy college student finds ways to do less reading. In the near future, it may be unnecessary to rely on used textbooks for another student’s highlights. Instead, the “time-challenged” scholar will be able to use Kindle’s Popular Highlights feature to see what many other students considered the important passages in the textbook. Q: What are Popular Highlights? The Amazon Kindle and the Kindle Apps provide a very simple mechanism for adding highlights. Every month, Kindle customers highlight millions of book passages that are meaningful to them. We combine the highlights of all Kindle customers and identify the passages with the most highlights. The resulting Popular Highlights help readers to focus on passages that are meaningful to the greatest number of people. We show only passages where the highlights of at least three distinct customers overlap, and we do not show which customers made those highlights. I’ve been noticing Popular Highlights in a book I’m reading for a continuing education course. Although they are not particularly germane to the course I’m taking, as the highlights come up I can see how they could be very helpful in cases where hundreds of students are using the same book for the same course. New Year’s resolution – a book a month? I’m thinking about reading some of these as a new year’s resolution, maybe tackling one book each month. Some of these books I can either get free or for less than a dollar on my Kindle. Although most of them are under 200 pages, in the comments it was noted that a few of these are really not two-hour reads (Wuthering Heights?). As a slow reader, I should take that into account. Some more ideas are in the comments, including one of my favorites, The Old Man and the Sea by Hemingway. It would be interesting to re-read some books that I remember fondly from my youth and see if they’ve stood the test of time. Two (or three) hours a month – how hard can that be? I can think of it as my own personal battle against the end of deep and focused reading. 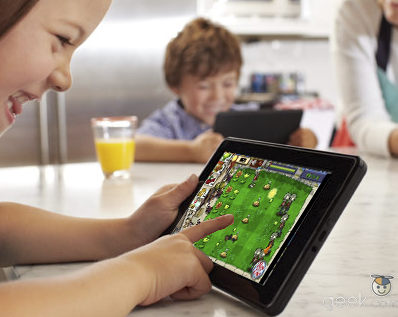 Kindle Fire – the end of deep and focused reading? After using it for about a month, I have found it is sometimes challenging to focus when reading a book on my Kindle Fire. When I’m out and about I can often find free WiFi, which means I can access the Internet. So I can relate to Alexandra Petri’s lament about her Kindle Fire. Look, if you put the Internet on the device I am supposed to be using to read, I will never read again. Can you blame me? I am only human. I can’t focus. If all these studies about multitasking have taught us anything, it is that we all think we can multitask but no one actually can. In the course of writing this I have eight times run off and reloaded the page to see if anything had happened on YouTube that I should know about. The end of reading books? It’s not that people will stop reading. We do vast amounts of reading online every day — the equivalent of a good Hemingway novel. But it’s not deep but broad, not focused but fast. Students need deep and focused reading skills to learn, so this possible trend is worrisome. Posted in learning, preparing for college | Comments Off on Kindle Fire – the end of deep and focused reading? That sounds about right. 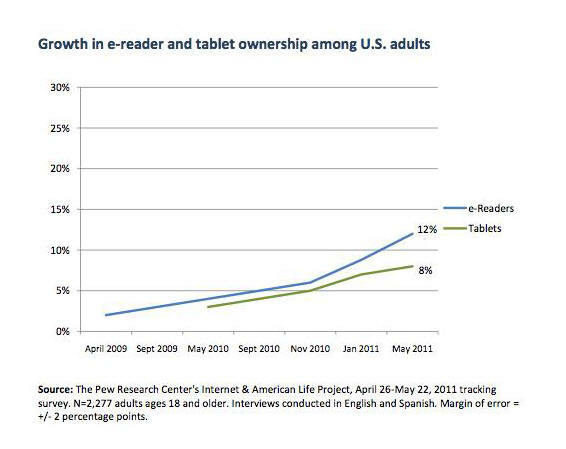 “All” my friends and relatives either own e-readers or are talking about which one to buy. Around Christmas time, it seemed as if all “everyone” was getting an iPad, but apparently growth in tablet computer ownership has slowed down. I own neither an e-reader nor a tablet computer; I’m still in the “talking about” stage.